We started the evening splitting into three groups, the first of which played Machi Koro. This was the “Feature Game” a couple of months back when it received a nomination for the coveted German Game of the Year, or Spiel des Jahres Award. In essence, it is an engine building game with elements taken from The Settlers of Catan and Dominion. Like Settlers, on their turn players first roll one or two dice, which yield resources, in this case money. Players then use their money to buy cards like Dominion. Each card is numbered and provides money, sometimes when the owner rolls, sometimes when someone else does, with the amount sometimes depending on the other cards a player has. Players have five special buildings costing varying amounts and the winner is the first player to build all of them. Red, Yellow, Orange and Cyan started setting up while people finished eating, but Red emigrated to play the hidden traitor game, Saboteur, with Teal and Violet when they arrived. This is one of those little games that everyone always enjoys playing and plays lots of people well. With only three players, it’s possible to have one bad dwarf, or none at all which makes everyone very twitchy, and as usual, accusations abounded. After three rounds, Teal ran out the winner with five gold. Machi Koro and Saboteur finished together to the two groups coalesced to play Colt Express. This had been the “Feature Game”, last time, however, none of this group had been available to play. Red was particularly keen to give it a go as it has a lot in common with one of her favourite games, Walk the Plank!. This style of game is sometimes refereed to as a “programming game” because players play all the cards and only after everyone has played cards, do they get to action the cards. The effect of this is semi-organised chaos as players try to make plans to take care of all eventualities, and then find that by the time they get round to carrying out the actions the situation has completely changed and is nothing like they would have predicted. This time, Orange took the $1,000 for the sharpest shooter and Cyan took the strongbox. Despite this, the best thief turned out to be Yellow who finished with $2,700 some way ahead of Cyan in second place. Meanwhile, everyone else had been playing the “Feature Game”, which was Last Will. This is basically the boardgame equivalent of the 1985 film “Brewster’s Millions”. The story goes that in his last will, a rich gentleman stated that all of his millions would go to the nephew who could enjoy money the most. In order to find out who that would be, each player starts with a large amount of money, in this case £70, and whoever spends it first and declares bankruptcy is the rightful heir, and therefore the winner. The game is played over a maximum of seven rounds each comprising three phases. First, starting with the start player, everyone chooses the characteristics of their turn for the coming round from a fixed list. These include the number of cards they will get at the start of the round, the number of “Errand Boys” they will be able to place, the number of Actions they will get and where they will go in the turn order. For example, a player may choose to go first when placing Errand Boys, but will then only get one card at the start of the round and crucially, only one Action. On the other hand, a player may choose to sacrifice position in the turn order, draw no cards, only place one Errand Boy, but receive four Actions. Since all but two cards are discarded at the end of the round and Actions must be used or lost, this decision is critical. Next, in the revised turn order, players take it in turns to place one Errand Boy before placing their second if applicable. Errand Boys are important as they allow players to control the cards they are drawing as well as manipulate the housing market and increase the space on their player board. The heart of the game is the cards, however, which are played in three different ways: as a one off (white bordered cards); on a player’s board (black bordered cards) or as a modifier (slate bordered cards) which enable players to spend more when black or white bordered cards. Thus, White bordered cards are event cards which cost a combination of money and Actions to play, but once played, are discarded. Black bordered cards cost at least one Action to play, but are kept and can be activated once in each round. Black bordered cards come in three different types: “Expenses” which allow players to spend money; “Helpers” which additionally allow give players some sort of permanent bonus, and “Properties” which are by far the most complex cards in the game. Properties are an excellent way of spending money as they are bought for a given amount and will either depreciate every round, or will require maintenance which can be expensive. 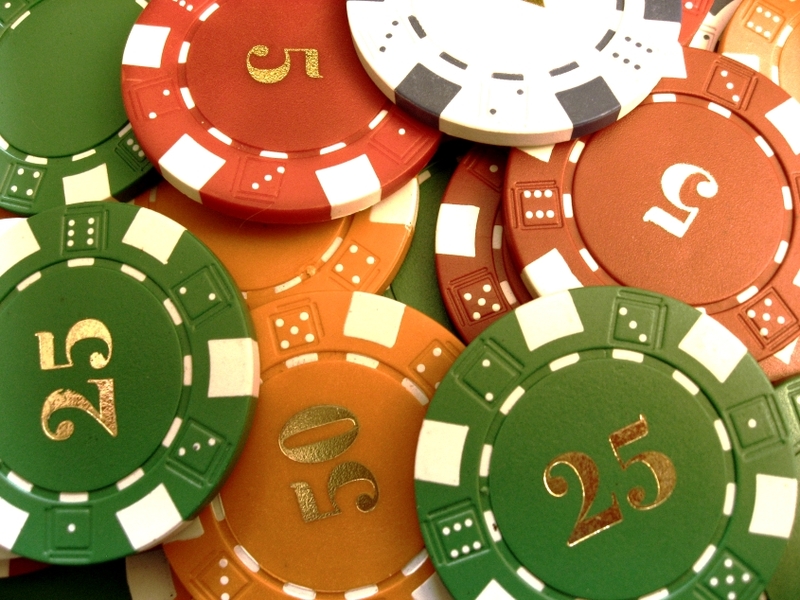 Unfortunately, players cannot declare bankruptcy if they have property and must sell them. This is where the property market comes in: one of the possible errands is to adjust the property market, so if a property is bought when the market is high and sold when it is low, this is another possible avenue for losing money. At the end of the round, everyone reduces their hand to just two cards and loses any left-over actions, which puts players under a lot of pressure as it makes it very hard to plan. So the game is an unusual mixture of timing, building card combinations, strategy and tactics. Only Blue had played it before and that was a long time ago, so it took a long time to explain the rules and make sure that everyone understood how the cards worked. Even then, there were a lot of misunderstandings. Burgundy had also read the rules quite carefully as well though and mostly managed to keep everyone on track. Green (as the last person to the bar and therefore the last person to buy something) went first and started out with an “Old Friend” which gave him an extra action. Burgundy went for a “lots and lots of cards which don’t cost an Action to activate” strategy while Black and Purple went into the properties market. Meanwhile, Blue’s starting cards favoured buying farms, but by the end of the first round it was becoming clear that the cards she needed weren’t there and an Events strategy would probably be better. Towards the end of the fourth round it was becoming obvious that Burgundy’s preparation (reading the rules) was paying dividends as he was systematically spending more than £12 per round – the amount needed to force an early finish to the game. Blue on the other hand was trying to work out why her pile of poker chips didn’t seem to be decreasing. By the end of the fifth round it was clear that Green was pressing Burgundy hard and there would only be one more round. A quick bit of maths also suggested that there had been a “banking error”. Although it would normally be in Blue’s favour, unfortunately, as this is game where players are trying to lose money, it didn’t help her. Since she had been in charge of the poker chips though, it could only have been her own fault. The game came to an end in round six when Green ran out of chips. This left him with a final total of zero and everyone else trying to make the best of the final round. Black and Purple tried selling off their properties and Blue held another couple of expensive parties, but it was Burgundy who spent £20 to finish the winner with £13 of debt. As we put the game away, we agreed that it was quite an unusual game, though quite complicated, especially on the first play. We also all felt that it was the sort of game that would benefit from the familiarity with the cards that comes from repeated plays, so it is quite likely that we’ll play it again soon. With everyone else gone, there was just time for a few quick rounds of Love Letter. This is a game we played a lot a year or so ago, but not so much recently. The first of the so-called “micro games” it is played with just sixteen cards. Each player starts with one card and on their turn, draws a second card and then plays one of them. Each card has a value (one to eight) and an action (discard a card, swap cards with another player, compare cards, etc. etc.). The object of the game is to have the highest card when the deck has been exhausted or, be the last person remaining, which ever is soonest. 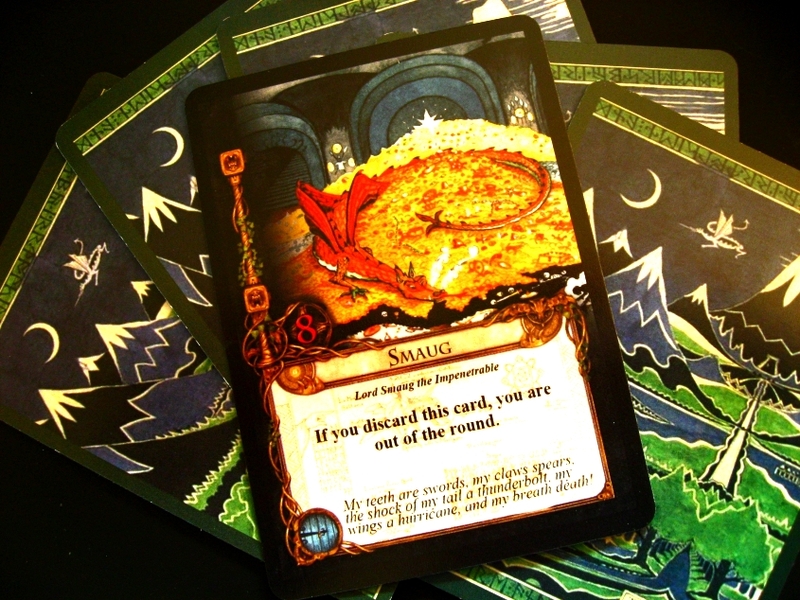 For variety, we played with Green’s much loved, very battered, previously lost but recently re-found, home-made, “Hobbit” themed deck, complete with tiny gold rings. So, the first problem was remembering what all the cards did and then trying to match them to the new characters… With five, we played until the first player had two rings – everyone got one except Burgundy before Black won a second round and finished as the winner. Learning Outcome: Spending money is not quite as easy as you think. This entry was posted in Games Night and tagged Colt Express, Dominion, Last Will, Love Letter, Machi Koro, Saboteur, The Settlers of Catan, Walk the Plank! on August 10, 2015 by nannyGOAT. The 2015 winner of the coveted German Game of the Year or Spiel des Jahres award is Colt Express which is a game about bandits robbing an amazing 3D train. 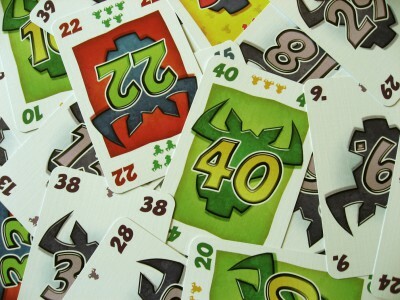 The game plays in two phases: first everyone plays action cards cards onto a common pile and then the action cards are resolved in the order they were played. There were three games nominated for the Spiel des Jahres this year and we’ve played the other two, Machi Koro and The Game, so we’ll play Colt Express next week to see what all the fuss is about! At the same time the Kennerspiel des Jahres was awarded, which honours more challenging games. It was introduced in 2011 to replace the jury’s habit of intermittent special awards for games too complex for the Spiel des Jahres (notably Agricola which was awarded a special “Complex Game” prize in 2008). The 2015 award went to Broom Service, which is a reimplementation of the 2008 Spiel des Jahres nominated game, Witch’s Brew. It is a role selection game where players collect potions, then deliver them across the land to towers that advertise their desires with color-coded roofs. This year we haven’t played this or either of the other nominees (Orléans and Elysium), but it probably won’t be long before we do. This entry was posted in News and tagged Agricola, Broom Service, Colt Express, Elysium, Machi Koro, Orléans, The Game, Witch's Brew on July 7, 2015 by nannyGOAT. 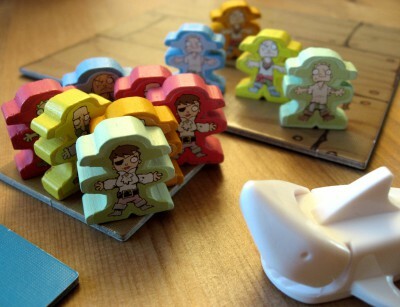 Each year a jury of German-speaking board game critics (from Germany, Austria, Switzerland), review all the games released in Germany in the preceding twelve months. Their job is a really important one amongst gamers, because they award the coveted Spiel des Jahres, the German Game of the Year. There are also other awards including the Kinderspiel and Kennerspiel des Jahres (Childrens’ and Connoisseurs’ Games of the Year). These awards are highly lucrative for the winners as many German families look for the red logo when choosing games to buy at Christmas. rule structure (composition, clearness, comprehensibility). The announcement of the Spiel and Kennerspiel des Jahres awards will be made early in July. Last year, the winner was Camel Up with Splendor as runner-up and Istanbul taking the Kennerspiel des Jahres award. The nominees for this year have just been announced and this year, unusually, we haven’t played any of them in the group yet. However, one of our more popular two-player games, Patchwork was included as a recommended game and we are planning to play one of the nominees, Machi Koro, this week. This entry was posted in News and tagged Camel Up, Istanbul, Machi Koro, Patchwork, Splendor on May 18, 2015 by nannyGOAT.